Translink, the Metro Vancouver regional public transportation authority, recently promoted a series of pet peeves suggested and voted upon by its rapid transit Skytrain customers. Some of the top irritants involved manners and hygiene that created discomfort to those near them – the Funky Ferret, Hungry Hamster, Chatty Chihuahua for example (as well as in part a New York transit campaign against manspreading) – but others had more to do about some behaviors that hampered the ability of others to use the Skytrain. Take the Blocking Bunny. This is someone who positions him or herself at the Skytrain door who obstructs those who are trying to enter or exit the vehicle. This is frustrating for those who want to leave the train, but more of a problem if the Blocking Bunny prevents people from getting in causing the train to leave passengers behind at the station. Vancouver’s winters are mild compared to the rest of Canada, but they can still be unpleasant to be standing outside on cold, windy, and wet days, and everyone hates being unnecessarily delayed from getting to work, home or where-ever their destination. This is also, though, an issue of efficiency since full Skytrain capacity doesn’t get used. 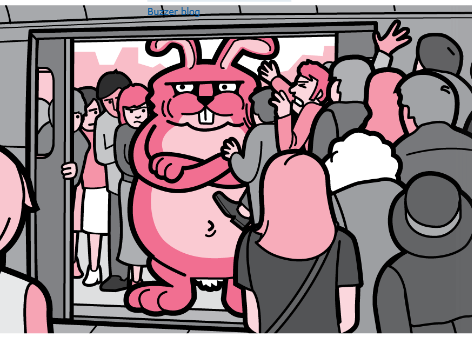 It’s an impediment when it comes to one car in a train, but a bigger problem to the whole system as more and more Blocking Bunnies and their compatriots – Crowding Kitty, Bird Bigbags and Lounge Lizard – obstruct other transit customers from using the train. This case is no different when you consider the driver only car on the street system including parking. Of course, there are a multitude of legitimate reasons why car operators choose to use their vehicles to drive just themselves to their destinations, but at the same time, there are many compelling arguments for drivers to consider other options that will ultimately benefit everyone, including themselves, in broader terms. Part of the problem may be that these options often require these people to make an extra effort to move beyond their immediate comfort zone. For many single occupant cars, the situation isn’t quite the same as for the Blocking Bunny who only has to move out of the way of the entrance to resolve the issue, but the issues are similar. Despite all of the public service messages, people like these sometimes remain oblivious that they may be part of a bigger problem, but we are all busy people who can often be too preoccupied with our own affairs to realize we are being negligent other transit and street users as well as the simple ways we could all contribute towards alleviating the problems with our public transportation system. This also highlights a key point that is being ignored about the public transportation challenges we face now and into the future: it is not the government or Translink who are putting more cars on the road than the system can effectively handle; we are the ones who are responsible for the congestion that threatens our health, environment and livelihoods. Too many place the blame at the feet of Translink and the local and provincial governments while conveniently ignoring or contemplating any effort we all can make to lessen our impact to the community. It is disingenuous for Metro Vancouver residents to not properly consider what is being voted on in this upcoming public transportation referendum. Most of us are a bigger part of the problem than many care to accept, but we can also be part of the solution. For the short term, we can all make better transportation decisions that will help ease the pressure on our streets and public transit. This can be as simple as better planning our trips to achieve our tasks all at once rather than making separate trips for each chore. The difficulty is that individually, we are incapable of expanding the streets, bridges, and public transit systems. That is why, rather than making this an anti-authority or anti-tax issue, this referendum needs to be considered a matter of public interest. Using this vote simply as an opportunity to criticize our governments and their institutions is self-serving, unproductive, and irresponsible. These proposed investments into our public transportation system deserve to be judged on their merits alone in terms of whether or not they will benefit our region. Thanks ER, missed hearing from you! BTW, despite the title of the youtube post, that video was in Japan where that kind of train packing is well known. Have only experienced that once in all of my travels there, but the train systems there are incredible! I found the Tube fine the one time I visited London though much smaller than I expected, especially when compared to subways in Tokyo and New York. I missed all the chatting too! Haha! Thanks for the update. It’s amazing what the Japanese can do ! I’d love to visit Japan – its one of the top places on my list – not quite sure I’d enjoy the train packing though, I’m mildly claustrophobic and just thought of being stuck in the London tube gets my heart racing ! The tube is not the issue, but tube traffic though, gets progressivley worse with time – it was much leas crowded five years ago – i can tell by my claustrophobic meter 😛 its worst at peak hours – the bane of public transport all over the world! Havent been to Tokyo or New York yet but it is indeed more cramped compared to Toronto subs!